The wonderful bunnies that have touched our lives are our inspiration. A few years back my husband and I were approached by our youngest daughter about getting a rabbit. When the subject was brought up the only experience I had with rabbits was one of my brother years ago having hutch rabbits. At this time my daughter spent time on educating us that House Rabbits were very much like having a cat – and in fact they can be litter box trained and are very very smart. Thumper was our first experience with having a House Rabbit. We brought Thumper home at the age of 6 weeks old. Unfortunately we truly didn’t know what we should about rabbits when we brought him home but we learned. I did call a vet that was listed as a small animal vet and was told there was no need to get him checked or neutered. Thumper was a very smart bunny and he did pretty good in our home. We soon learned though that getting a rabbit fixed or in his has neutered was a really good idea. 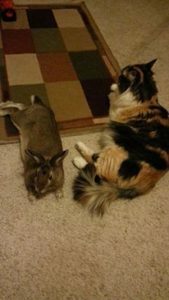 Thumper had decided he was in love with the cat and would not leave her alone. Once he was neutered this improved and his litter box habits improved greatly. 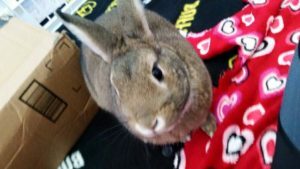 Thumper was a great bunny and had full run of the house and slept in a kennel/crate at night. Unfortunately, we were not as educated as we should have been on the health of rabbits and one evening Thumper was not himself and wasn’t eating. We rushed him to the vet the next morning, but unfortunately we lost Thumper that morning. This was the first experience with having loved and lost a bunny and it was one of the most painful experiences.